My regular programming site has been off-line for awhile. This WP page should work for a couple posts, at least. One of the things I’ve been doing lately is that I’ve been looking at the kernels of operating systems developed by small groups of people, or OS projects that might be described as hobby projects. These are wonderful things for a guy who’s spent most of his life doing user-land programming. 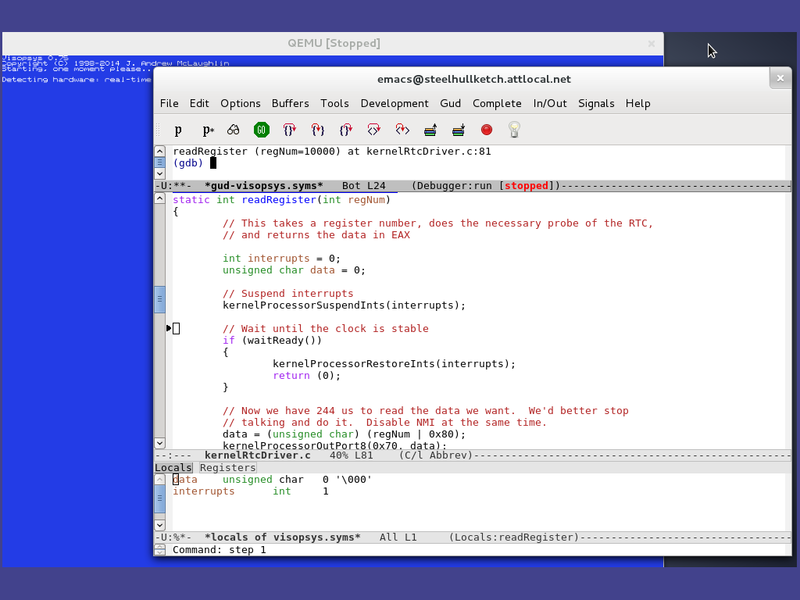 Even a user-land programmer gets to brush up against the kernel occasionally, when using traditional systems. We may be involved with writing the drivers, living at the periphery of the kernel, if we have some hardware knowledge. Most of us don’t even do that. Yet – we never really gain a comfort level, and we live with a feeling that there’s “stuff going on down there,” in the big blackbox that underlies all. We’re never necessarily one hundred percent sure about what is going on “down there”. Most people like me have a latent desire to know more about all that which lies below their own code, inside the system kernel, and makes their own code possible. Few ever do anything about it. Kernel developers have few peers, and live in the rarefied airs of programmingdom.